Hilda Solis talks to The Nation about getting the Labor Department its teeth back, her worst moment as secretary and her legacy. Outgoing Labor Secretary Hilda Solis. AP Images. Hilda Solis recently announced that she is leaving her post as secretary of labor, a job that she has held since February 2009. Solis has spent her career in politics, serving in both the California Assembly and Senate; in the US House of Representatives, and, since 2009, as President Obama’s labor secretary. She was the first Latina woman in the California State Senate and the first to serve as a cabinet secretary in DC. Over the years, Solis has championed such causes as environmental justice, the rights of farmworkers, expansion of healthcare access and an increase in the minimum wage. Here, she looks back on her four years as Labor Secretary, and outlines the challenges that remain. Sasha Abramsky: You came in four years ago in an economic free fall. What were your immediate priorities? 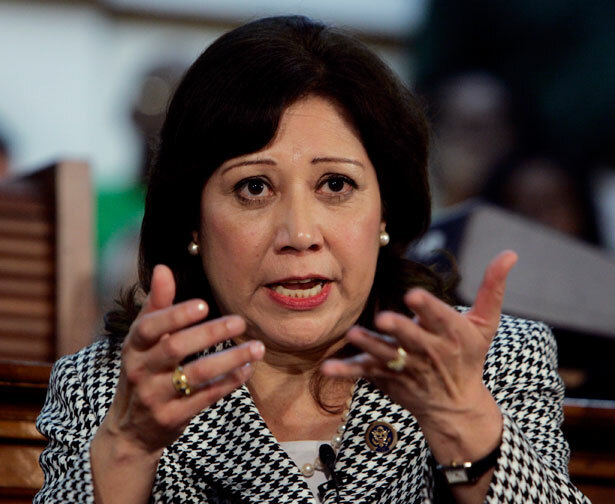 Hilda Solis: First of all was to stop the hemhorraging of job loss. That was my immediate concern; making certain that we utilized all tools available to helping people who were losing jobs, and helping businesses too—because they were shuttering around the country. And different parts of the country were harder hit, like Ohio, Michigan—Detroit. You saw a tremendous loss of manufacturing jobs. We had to get out there quickly and provide whatever training dollars we could to provide opportunity for people to get trained; and the extension of unemployment insurance was critical; that in and of itself is a stimulus. For every dollar that is spent by a recipient, two additional dollars are generated in the community; it helps to keep businesses open. People spend that money. Did you have time back in February ‘09 to think about longer-term priorities? We knew we had to revamp our programs. The president was able to get the American Recovery Act funding out. For the first time in a long time we were able to fund programs that we know worked. Extension of assistance to dislocated workers, and extension of benefits that went up to 99 weeks for some states and individuals. And giving summer youth employment a priority. That’s so critical and hadn’t been done in a decade. Youth suffer tremendously in a recession, especially young men and women of color. Typically, during recessionary times, particular groups suffer higher rates of unemployment—African Americans, and Latinos, and in some cases other minority groups. If you don’t have a high level of training or education you’re going to fall into that category. We can change those trends by getting more people into job training programs—which we did starting in ‘09, we actually served 1.7 million people, and provided them with crucial training programs and assistance, and about one million earned what we call industry-recognized credentials to help them continue to be a part of this very competitive job market. Are we where you hoped to be four years after you took the job? When I started we knew we had to stop the job losses, bring down the unemployment rate and get assistance to those areas hardest hit. Not only did we provide job training, unemployment insurance benefits, but we took a great responsibility in helping to provide better enforcement policies for worker protection and safety. That had been absent for almost a decade. We decided it was going to be a big priority. Under ARRA money we were able to hire about 700 new investigators in our wage-and-hour division, OSHA, mine safety, health administration and just about all our enforcement agencies, including EBSA—the employment benefit security administration—all meant to help working-class people, people in the middle who were being squeezed and losing homes, assets, pensions, losing their jobs. Under your watch the department has been far more assertive than under many previous administrations. What did you regard as your mandate? The mandate was to bring back an agency that had lost its ground, its teeth. This was, in essence, one of the agencies that really did not have sufficient support by the previous administration. In fact, I heard story upon story that when people would call in to make complaints that they weren’t being paid appropriately or were being terminated unlawfully they would not be acknowledged. They went in some file. Investigations weren’t being done. We changed that. Went out to work with different stakeholder groups, did it more strategically, looked across the board and began to systemically go after the most egregious violators. It sent a message. I’m happy, because as a result you see more people getting their back wages. We have a record for providing $280 million worth of collected back wages for more than 300,000 workers. And that’s just a beginning. It’s historic. Since the 2010 elections you have had to deal with a very obstreperous Congress. Who’s put at risk by the current political climate? All American workers are put at risk. Even businesses are fearful of going to the next step—hiring up people or increasing production, because they see there are misgivings with this new Congress. Thank goodness the Senate remained in our hands and was able to hold off on many of the more egregious things that were put forward. The new Congress wanted to wipe out our enforcement tools, cut back dramatically on workplace training programs and paralyze our enforcement efforts. No. That would be the wrong thing to do. Did we get hit by some of their policies? Yes, we had to reduce our budgets in some cases, but we had to do it wisely. This president made it a point to not hurt the most vulnerable. Related to this, over the last couple of years, at a state level you’ve got these extremely reactionary anti-worker laws—in Wisconsin, Ohio, Michigan, in the old industrial heartland. What can the federal government and Department of Labor do to counter this? A lot will depend on the enforcement and treatment of collective bargaining agreements, how those are carried out in terms of fairness. Making sure that we hold states accountable for how they run and administer our programs. If they don’t comply, we can pull funds. I can think of training programs, and the money we give to states to help to subsidize OSHA enforcement. There’re a lot of things we can do. When you were in California state politics, you pushed for a higher state minimum wage. I know there’ve been good things in some states and cities over the past decade—with minimum and living wage laws and ordinances. But overall, one of the things that characterize the last several years is the rise of rampant inequality. One of the crises still to be confronted is low wages amongst those with employment. What can the Department of Labor do on this? We can do some through regulations. There are proposals, for example, regarding domestic healthcare workers; you’ll be surprised, there’ll be movement on that. We’ll shortly see progress made there. In terms of farm labor and child labor, we have more work to do, but we’ve put more troops on the ground, more investigators in the field that actually speak the languages of the groups they need to be working with, to inform them of their rights and ask for their assistance. So we can target the most egregious and get back wages and make sure those businesses that aren’t complying with the law are debarred. If you were creating an agenda for the next four years, what would your priorities be? We still have more work to do in terms of employment opportunities and education and training. The president has already set a goal of getting $8 billion to split evenly between community colleges and secondary education to provide more training opportunities for everybody, which will help improve working conditions, because people can get better salaries and can be competitive. Businesses will prosper from that, because they have complained often about not having people who are qualified. Two million people getting certificates and licensing for new jobs, in green sectors, or even in traditional manufacturing. We need people to be welders, but also have the ability to work on computers, have math skills. We still have a way to go, but the net should be broad and should encompass everyone. As the economy is restructured, how do you focus on environmentally beneficial, and socially fair, employment strategies? One sector it’s already proven true is the manufacturing base with respect to automobiles. I just came back from the auto show in Detroit and was so pleasantly surprised and proud of the kind of products being produced by folks in Detroit right now, and across the country. Bringing back jobs here, and investing in hybrids, electric vehicles, biofuels. All kinds of new technologies. Robotics. The fact that labor and management are sitting down at the table means the industry will thrive. It bodes well for us in the coming decades. Whether it’s infrastructure, transportation, all kinds of things where there’s a better relationship between workers and management. The UAW and Big Three coming together and saying their goals are shared, if we can see that grow, that would be great. What was your best and worst moment as labor secretary? Well, I’ll tell you, one of things I’m proud of is for someone from Southern California, who didn’t grow up around coal mines, I learned a lot that tragic day we lost twenty-nine miners at Upper Big Branch coal mine. As a result I got to work right away to see how we could improve enforcement, but also investigate how we could make improvements structurally in our own department. Just yesterday we released one of our regulations as a result of our investigation; on POVs—patterns of violation. Because many times coal companies would skirt the law and find it was better to pay a fine than to change their behavior. Now the message is clear that you won’t get away with that, that we mean business, that there are penalties. I hope to see more legislation enacted, because that’s where the teeth are. But until we have a Congress that’s more conducive and open to reform, things won’t change as fast. But I’m hopeful because the president did win re-election and that’s a mandate for change. Let’s see if we can minimize that segment of the Republican Party that refuses to change anything. One of service. One who gives back. One who respects all workers. One that fights for the voiceless. And one that continues to aspire for change, for the allowance of different voices to be heard and different perspectives to grow and be nurtured. That’s still unfinished business. Keep working. Keep involved. Keep engaged. Keep fighting for comprehensive immigration reform; keep fighting for environmental justice; keep fighting for elimination of healthcare disparities. And continue to fight for access for all, that there’s an assurance of civil rights for everyone under our constitution. That’s something that is very much a part of Hilda Solis. Whom do you hope to be compared to among your predecessors?